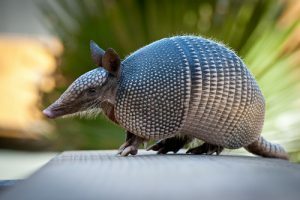 Perhaps best known for their distinctive appearance and ability to roll up into an armored ball, armadillos are easy to identify. The thick plates along their back shield them from nearly anything nature can throw at them, and they are simple, non-aggressive creatures who love digging up and burrowing through yards. While it may be their favorite pastime, it can mean big trouble for your property. Being able to spot the signs of an armadillo is important if one ever makes its way onto your property. Luckily, there isn’t another animal out there that looks like an armadillo, so they are very easy to spot. In addition to their round, armored shells, armadillos can be identified by the tufts of hair poking out from under their shell, as well as their scaly tails that match their shells. Armadillos also have long, pointed snouts and small, pointed ears. While armadillos are typically non-aggressive towards humans, they can still cause serious property damage. They dig and root around looking for bugs and vegetation to eat, and as they dig, they can seriously harm your grass or garden. Additionally, any underground water or power lines are at risk as well, if an armadillo is unlucky enough to come across one. When they dig, the ground around them can be weakened and make your property more prone to sinkholes; potentially putting your home at risk. Though they are interesting creatures, your property is no place for armadillos. If you’ve spotted them around your home, your best bet is to call the experts at Critter Control® of Orlando. Our staff can safely remove any armadillos from your property with humane methods that allow them to be relocated. If armadillos are calling your property home, call us today at 407.295.7194 to schedule your consultation.